The Split Riviera Top 5 Activities are great mixture of unforgettable experiences every visitor should consider when visiting the Dalmatian area of Croatia. The Split Riviera is the cultural and administrative area of the centre & middle Adriatic coast of Croatia, traditionally called Dalmatia, with the largest city Split as it’s main hub to connect to the Riviera’s main islands; Brac, Hvar, Pakleni islnds, Vis, Solta, etc. 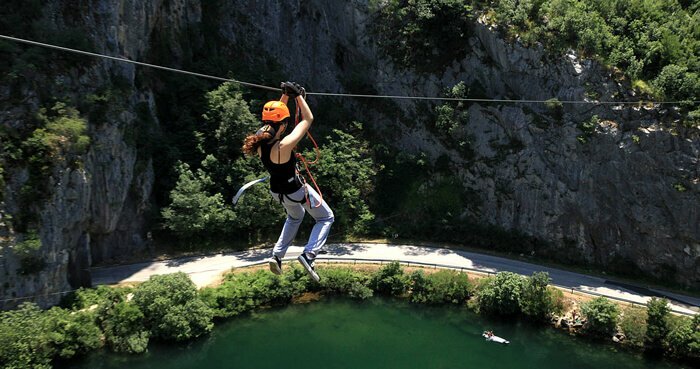 Discover and enjoy the following Split Riviera top 5 activities. Ideally situated, Brac is the closest island to the town of Split making it perfect for a one day getaway. 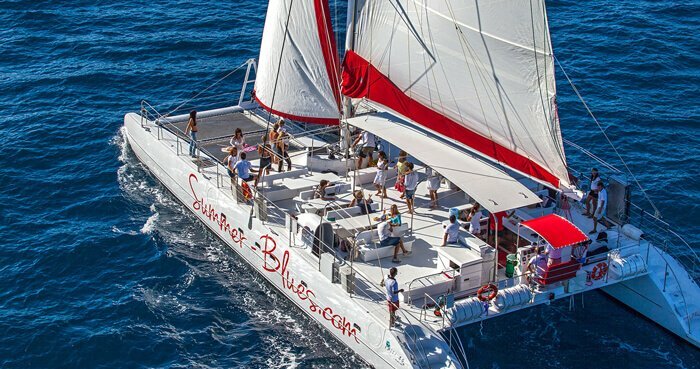 The catamaran Summer Blues offers an unforgettable means to discover the Island with its tranquil isolated turquoise coves as well as ‘’Zlatni rat’’, one of the most beautiful beach in Europe. Enjoy lunch with music on board before disembarking for a visit to the Pucisce stone sculpture school. For those wishing to spend more time on land, enjoy lunch in one of the many famous agro tourism properties or restaurants first row from the sea. The island offers a variety of outdoor activities including hiking, biking, and water sports. Cultural visits can be organized to several of the picturesque towns on the island along with tasting of local products. Regardless of whether you visit the island by speedboat, Dalmatian boat or catamaran, the island of Brac with its easy accessibility and numerous and varied possibilities make it an ideal choice for a day trip. The island of Hvar boasts of being the sunniest Dalmatian island. The scents of rosemary and lavender, a wooded shore and an exceptional cultural richness reveal why Hvar is a favorite island destination. Starting form Hvar, a charming medieval town unique in its cultural and historical heritage. What better way to explore the island in all of its richness than in a vintage Cabrio Volkswagen Beetle, the longest-running automobile of a single design ever produced. The group has a possibility to drive on their own and make stops for panoramic views or different tastings of local products either with a guide or with a road book per car as a team building concept. Either way, complete the experience with a traditional Dalmatian restaurants in small authentic villages. Get ready for an adrenaline rush. 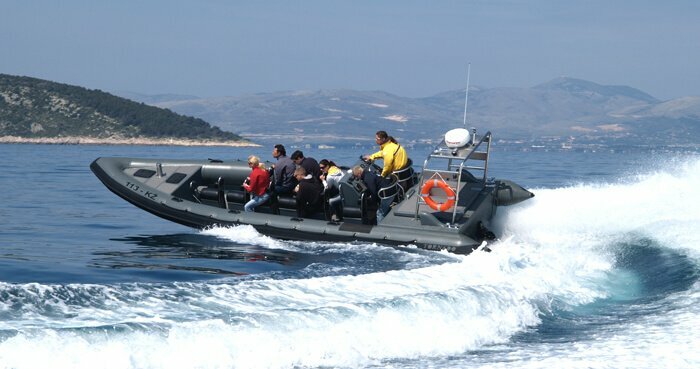 Built for emergency purposes and other professional tasks in all weather conditions Tornado boats, one of the best boats on the market, create an extreme experience very close to a ride on the roller coaster. Enjoy a Sea Safari experience past the Island of Vis to the Blue Cave on Bisevo that is so eternally fascinating with it its glowing blue light phenomenon before returning for an island lunch on the Pakleni islands, located opposite the entrance to the Hvar city harbor. Zipping through the canyon with the crystal clear water of the Cetina river flowing below, what an experience! The adventure begins with a training session followed by a short nature walk. Then, secured by a safety belt, a series of 8 steel lines takes participants through the canyon past waterfalls, lakes and untouched natural cliffs before bringing them to the river bank where a celebration lunch awaits at a local waterfront restaurant. The crystal clear water and a river suitable for swimming offers a true experience of untouched nature with its cliffs up to 180 meters high and a 50 meters high waterfall Gubavica while the local cuisine includes dishes from the Cetina River, frogs legs, smoked eels and trout dishes, hinterland such as bread and meat baked under the bell as well as fresh seafood from the sea round out the feast for all the senses. 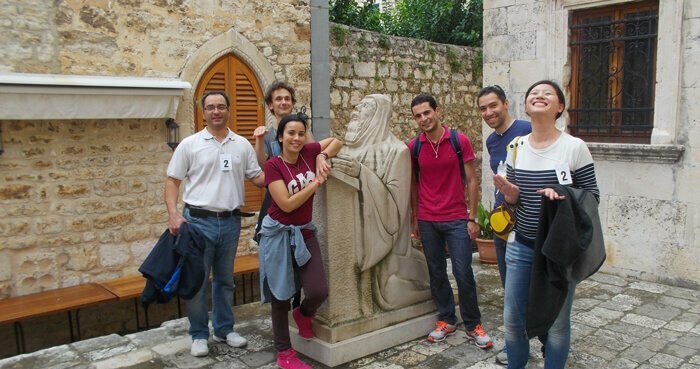 Urban challenge is a unique and interactive way to discover Split’s millennia of history while building a strong bond among participants racing against each other or against the clock. With map in hand and targets to collect teams dive into the ancient city center. Each team has to find answers on marked locations, either by asking locals or historically costumed actors before making their way to the finish line. Another option includes taking photos while performing set tasks or in set locations. Whichever you choose, lunch within the walls of Diocletian’s Palace where the winner is pronounced is a fun way to spend the morning. 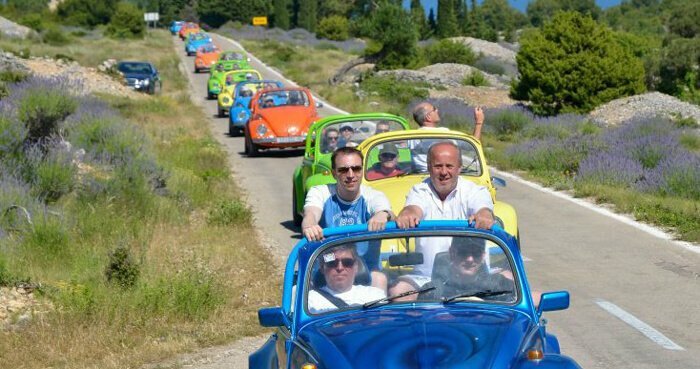 Split Riviera Top 5 Activities are only a few of very many activities and recommendations DT Croatia can provide for any group events you may plan. Contact us for more and do not forget to share these Split Riviera Top 5 Activities with your friends and colleges.